A geologic age is a subdivision of geologic time that divides an epoch into smaller parts. A succession of rock strata laid down in a single age on the geologic timescale is a stage. A stratigraphic column is a representation used in geology and its subfield of stratigraphy to describe the vertical location of rock units in a particular area. A typical stratigraphic column shows a sequence of sedimentary rocks, with the oldest rocks on the bottom and the youngest on top. The Aptian partly overlaps the upper part of the regionally used (in Western Europe) stage Urgonian. The Cretaceous is a geologic period and system that spans 79 million years from the end of the Jurassic Period 145 million years ago (mya) to the beginning of the Paleogene Period 66 mya. It is the last period of the Mesozoic Era, and the longest period of the Phanerozoic Eon. The Cretaceous Period is usually abbreviated K, for its German translation Kreide. The Aptian extinction was an extinction event of the early Cretaceous Period. It is dated to c. 116 or 117 million years ago, in the middle of the Aptian stage of the geological time scale, and has sometimes been termed the mid-Aptian extinction event as a result. The Aptian was named after the small city of Apt in the Provence region of France, which is also known for its crystallized fruits. The original type locality is in the vicinity of Apt. The Aptian was introduced in scientific literature by French palaeontologist Alcide d'Orbigny in 1840. Apt is a commune in the Vaucluse department in the Provence-Alpes-Côte d'Azur region in southeastern France. Provence is a geographical region and historical province of southeastern France, which extends from the left bank of the lower Rhône River to the west to the Italian border to the east, and is bordered by the Mediterranean Sea to the south. It largely corresponds with the modern administrative région of Provence-Alpes-Côte d'Azur, and includes the départements of Var, Bouches-du-Rhône, Alpes-de-Haute-Provence and parts of Alpes-Maritimes and Vaucluse. The largest city of the region is Marseille. The base of the Aptian stage is laid at magnetic anomaly M0r. A global reference profile for the base (a GSSP) had in 2009 not yet been appointed. The top of the Aptian (the base of the Albian) is at the first appearance of coccolithophore species Praediscosphaera columnata in the stratigraphic record. A coccolithophore is a unicellular, eukaryotic phytoplankton (alga). They belong either to the kingdom Protista, according to Robert Whittaker's Five kingdom classification, or clade Hacrobia, according to the newer biological classification system. Within the Hacrobia, the coccolithophorids are in the phylum or division Haptophyta, class Prymnesiophyceae. Coccolithophorids are distinguished by special calcium carbonate plates of uncertain function called coccoliths, which are also important microfossils. However, there are Prymnesiophyceae species lacking coccoliths, so not every member of Prymnesiophyceae is coccolithophorid. Coccolithophores are almost exclusively marine and are found in large numbers throughout the sunlight zone of the ocean. 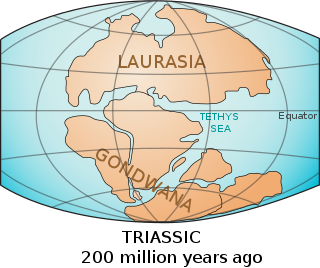 The Tethys Ocean, also called the Tethys Sea or the Neotethys, was an ocean during much of the Mesozoic Era located between the ancient continents of Gondwana and Laurasia, before the opening of the Indian and Atlantic oceans during the Cretaceous Period. Biostratigraphic unit or biozones are intervals of geological strata that are defined on the basis of their characteristic fossil taxa. Sometimes the Aptian is subdivided in three substages or subages: Bedoulian (early or lower), Gargasian (middle) and Clansayesian (late or upper). Examples of rock units formed during the Aptian are: Antlers Formation, Cedar Mountain Formation, Cloverly Formation, Elrhaz Formation, Jiufotang Formation, Little Atherfield, Mazong Shan, Potomac Formation, Santana Formation, Twin Mountains Formation, Xinminbao Group and Yixian Formation. Mazong Shan, Gansu, China A basal neoceratopsian, appears to have been bipedal and quite small (about 1 metre (3 feet) long) with a comparatively large head. Unlike many later ceratopsians it doesn't have any horns and has only a small bony frill projecting from the back of its head. Yixian Formation, Liaoning, China The largest mammal known from the Cretaceous period of the Mesozoic, and the one for which there is the best evidence that it fed on dinosaurs. Flat Rocks, Victoria, Australia The earliest known monotreme. Quantou Formation, Jilin, China As a small basal ornithopod, Changchunsaurus would have been a swift bipedal herbivore, feeding close to the ground. Lakota Formation, South Dakota, USA A genus intermediate between Camptosaurus and more derived iguanodonts. Xinminbao Group, Gansu, China A hypsilophodontid or other basal ornithopod, Siluosaurus would have been a bipedal herbivore. 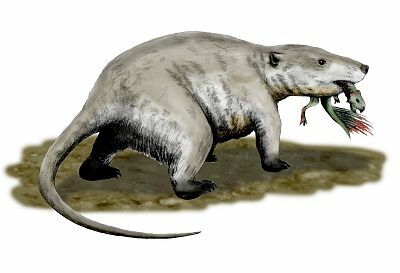 Australia Relatively small cryptocleidid, around 2.5 metres (8 feet) long, identified by the three crest-ridges on its skull. Itapecuru Formation, Maranhão, Brazil A genus of 12 metres (39 feet) long diplodocoid. Antlers Formation, Oklahoma, USA The last known giant brachiosaurid; extrapolations indicate that the head of Sauroposeidon could reach 17 metres (56 feet) in height, making it the tallest known dinosaur. With an estimated length of 30 metres (98 feet) and a mass of 36 to 40 tonnes (35 to 39 long tons; 40 to 44 short tons) it also ranks among the longest and heaviest. Grès Supérior Formation, Laos A basal titanosaur, known from the remains of two or three individuals. Marree Formation, South Australia, Australia A little-known maniraptoran known primarily from a single fossilized tibia, which had been fossilized through a rare process in which the bone through hydration turned to opal. Apart from the tibia, the first find included some small probable fibula fragments. Later a foot digit was referred that might have come from the same species, but the assignment is dubious. The tibia is broken into about ten larger pieces and roughly 33 centimetres (13 inches) long. It is very slender in build and shows the impression of the ascending process of the astragalus, an ankle bone itself lost. The process seems to have been very long and narrow. Kakuru is believed to have been carnivorous, was bipedal and about 2 to 3 metres (7 to 10 feet) in length. This small dinosaur seems to have had long, slender legs. The Barremian is an age in the geologic timescale between 129.4 ± 1.5 Ma and 125.0 ± 1.0 Ma). It is a subdivision of the Early Cretaceous epoch. It is preceded by the Hauterivian and followed by the Aptian stage. In the geological timescale, the Tithonian is the latest age of the Late Jurassic epoch or the uppermost stage of the Upper Jurassic series. It spans the time between 152.1 ± 4 Ma and 145.0 ± 4 Ma. It is preceded by the Kimmeridgian and followed by the Berriasian stage. The Toarcian is, in the ICS' geologic timescale, an age and stage in the Early or Lower Jurassic. It spans the time between 182.7 Ma and 174.1 Ma. It follows the Pliensbachian and is followed by the Aalenian. The Albian is both an age of the geologic timescale and a stage in the stratigraphic column. It is the youngest or uppermost subdivision of the Early/Lower Cretaceous epoch/series. Its approximate time range is 113.0 ± 1.0 Ma to 100.5 ± 0.9 Ma. The Albian is preceded by the Aptian and followed by the Cenomanian. The Gelasian is an age in the international geologic timescale or a stage in chronostratigraphy, being the earliest or lowest subdivision of the Quaternary period/system and Pleistocene epoch/series. It spans the time between 2.588 ± 0.005 Ma and 1.806 ± 0.005 Ma. It follows the Piacenzian stage and is followed by the Calabrian stage. The Aquitanian is, in the ICS' geologic timescale, the oldest age or lowest stage in the Miocene. It spans the time between 23.03 ± 0.05 Ma and 20.43 ± 0.05 Ma during the Early Miocene. It is a dry, cooling period. The Aquitanian succeeds the Chattian and precedes the Burdigalian. In the geologic timescale, the Valanginian is an age or stage of the Early or Lower Cretaceous. It spans between 139.8 ± 3.0 Ma and 132.9 ± 2.0 Ma. The Valanginian stage succeeds the Berriasian stage of the Lower Cretaceous and precedes the Hauterivian stage of the Lower Cretaceous. In the geologic timescale, the Callovian is an age and stage in the Middle Jurassic, lasting between 166.1 ± 4.0 Ma and 163.5 ± 4.0 Ma. It is the last stage of the Middle Jurassic, following the Bathonian and preceding the Oxfordian. The Campanian is the fifth of six ages of the Late Cretaceous epoch on the geologic timescale of the International Commission on Stratigraphy (ICS). In chronostratigraphy, it is the fifth of six stages in the Upper Cretaceous series. Campanian spans the time from 83.6 to 72.1 million years ago. It is preceded by the Santonian and it is followed by the Maastrichtian. The Cenomanian is, in the ICS' geological timescale the oldest or earliest age of the Late Cretaceous epoch or the lowest stage of the Upper Cretaceous series. An age is a unit of geochronology: it is a unit of time; the stage is a unit in the stratigraphic column deposited during the corresponding age. Both age and stage bear the same name. The Turonian is, in the ICS' geologic timescale, the second age in the Late Cretaceous epoch, or a stage in the Upper Cretaceous series. It spans the time between 93.9 ± 0.8 Ma and 89.8 ± 1 Ma. The Turonian is preceded by the Cenomanian stage and underlies the Coniacian stage. The Coniacian is an age or stage in the geologic timescale. It is a subdivision of the Late Cretaceous epoch or Upper Cretaceous series and spans the time between 89.8 ± 1 Ma and 86.3 ± 0.7 Ma. The Coniacian is preceded by the Turonian and followed by the Santonian. The Hettangian is the earliest age and lowest stage of the Jurassic period of the geologic timescale. It spans the time between 201.3 ± 0.2 Ma and 199.3 ± 0.3 Ma. The Hettangian follows the Rhaetian and is followed by the Sinemurian. Ornithocheirus is a pterosaur genus known from fragmentary fossil remains uncovered from sediments in the UK. Tropeognathus is a genus of large pterosaurs from the late Early Cretaceous of South America. It was a member of the Ornithocheiridae, a group of pterosaurs known for their keel-tipped snouts, and was closely related to species of the genus Anhanguera. The type and only species is Tropeognathus mesembrinus; a second species, Tropeognathus robustus, is now considered to belong to Anhanguera. 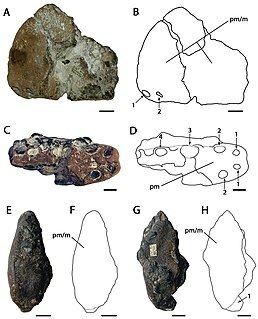 Fossils of Tropeognathus have been recovered from the fossiliferous Romualdo Formation of the Araripe Basin in northeastern Brazil. Tapejaridae are a family of pterodactyloid pterosaurs from the Cretaceous period. Members are currently known from Brazil, Hungary, Morocco, Spain and China, where the most primitive genera are found, indicating that the family has an Asian origin. The Cenomanian-Turonian boundary event, or the Cenomanian-Turonian extinction event, the Cenomanian-Turonian anoxic event, and referred also as the Bonarelli Event, was one of two anoxic extinction events in the Cretaceous period. The OAE 2 occurred approximately 91.5 ± 8.6 Ma, though other estimates are given as 93-94 Ma. The Cenomanian-Turonian boundary has recently been refined to 93.9 ± 0.15 Ma There was a large carbon disturbance during this time period. However, apart from the carbon cycle disturbance, there were also large disturbances in the oxygen and sulfur cycles of the ocean. The Norian is a division of the Triassic geological period. It has the rank of an age (geochronology) or stage (chronostratigraphy). The Norian lasted from ~227 to 208.5 million years ago. It was preceded by the Carnian and succeeded by the Rhaetian. Timeline showing the development of the extinct reptilian order Pterosauria from its appearance in the late Triassic period to its demise at the end of the Cretaceous, together with an alphabetical listing of pterosaur species and their geological ages. ↑ Li, Yong-Xiang; Bralower, Timothy J.; Montañez, Isabel P.; Osleger, David A.; Arthur, Michael A.; Bice, David M.; Herbert, Timothy D.; Erba, Elisabetta; Premoli Silva, Isabella (2008-07-15). "Toward an orbital chronology for the early Aptian Oceanic Anoxic Event (OAE1a, ~ 120 Ma)". Earth and Planetary Science Letters. 271 (1–4): 88–100. Bibcode:2008E&PSL.271...88L. doi:10.1016/j.epsl.2008.03.055. ↑ Leckie, R.; Bralower, T.; Cashman, R. (2002). "Oceanic anoxic events and plankton evolution: Biotic response to tectonic forcing during the mid-Cretaceous" (PDF). Paleoceanography. 17 (3): 1–29. Bibcode:2002PalOc..17.1041L. doi:10.1029/2001pa000623. ↑ Archangelsky, Sergio. "The Ticó Flora (Patagonia) and the Aptian Extinction Event." Acta Paleobotanica 41(2), 2001, pp. 115-22. ↑ Mortimer, Mickey. "List of Dromaeosaurids". Archived from the original on October 3, 2011. Retrieved July 8, 2011.